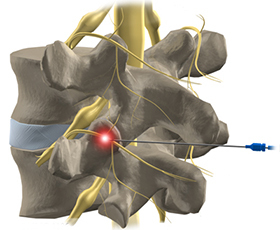 Radiofrequency Neuroablation, also known as Rhizotomy or Radiofrequency Ablation (RFA) has become a major resource for most pain management physicians, specially with spine related pain, to treat severe chronic joint-related pain in the low back (lumbar spine), mid-back (thoracic spine), neck (cervical spine), and sacroiliac joints. Radiofrequency neuroablation has proven to be successful in treating chronic pain that has been unresponsive to other types of treatment therapies by damaging (ablating) a nerve so it can no longer transmit pain signals. After all, nerves are how pain signals travel from the injured region(s) of the body to the brain. Our pain management specialists in Broward and Palm Beach county are available in our offices in Boca Raton, Deerfield Beach, Coral Springs, and Plantation. For appointments, call Spine & Orthopedic Center at 888-409-8006. Radiofrequency Ablation uses radiofrequency energy (thus the name) to interrupt nerve function. It is basically an electrical current produced via radio waves used to heat up (ablate) a small area of nerve tissue which leads a decrease in pain signals from that specific area to the brain. During the procedure, a local anesthetic will be used to numb the skin. The injection is performed under x-ray or fluoroscopy guidance to ensure precision. Once the needle is precisely placed, the nerve will be numbed. Then, radiofrequency energy will be used to diffuse pain signals of the branch. 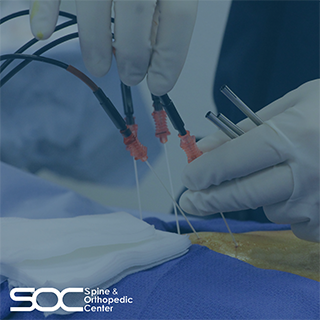 Patient should expect immediate pain relief which may last from 6 to 24 months since nerves normally regenerate after a Radiofrequency Neuroabalation procedure. The pace of the nerve regeneration varies from patient to patient. However, once the nerves regenerate, the pain may or may not reoccur.